Nivomat to Standard Damper Mod Kit. To Fit: Volvo 850, S/V70 Series all models(Classic Shape)up to 2000, Rear, (Excludes AWD Models). 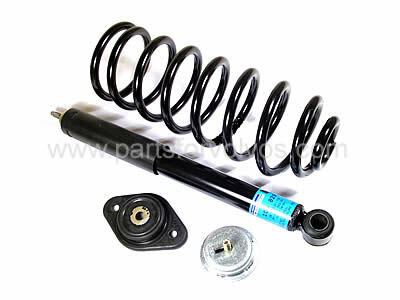 This kit enables you to change from the expensive self levelling shocks (Nivomat) to the standard Sachs shock absorbers and springs for less than the cost of replacing one nivomat shock! 2 x Standard Sachs Rear Shock Absorbers. 2 x Heavy Duty Rear Coil Springs. 2 x Rear Top Strut Mounts. 2 x Lower Coil Spring Mounts.